They're echinoderms, related to sea stars and sea cucumbers. They have bony plates just below their skin, which come together like orange slices to form a tough skeleton called a test. Not all plates have spines attached to them, though. 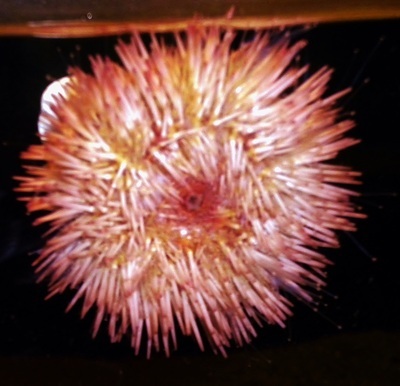 Every other plate has many tiny holes, through which a sea urchin can wiggle its tube feet. They eat seaweed, algae, mussels, sponges, and parts of dead fish and other marine life. On the urchin’s underside is a mouth that looks like a claw and has five strong teeth. Their eggs and flesh are food for people, particularly in Europe and Asia. They can live up to 100 years, on the ocean bottom (some burrow under the sand), coral reefs, tide pools and near rocky shores. They come in many varieties: Their spines may be short and stubby or as long as 12 inches; venomous or not; needle thin or pencil thick; sharp or dull. There are about 700 species in colors including black, purple, brown, orange, red and white. They're usually two to four inches in diameter, including their spines. They're masters of disguise: Some sea urchins use their tube feet to pick up small rocks, shells or seaweed to cover themselves. 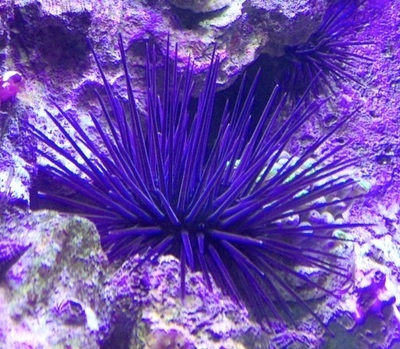 They can blend in with their surroundings and hide from sea stars, eels, sea otters and other enemies. They can’t swim, but they can “walk”: Sea urchins use their tube feet, which are equipped with suction cups, and their spines to move along solid surfaces, such as the ocean floor or rocks. They have two types of spines: Some are solid; others are hollow and filled with a small amount of venom. 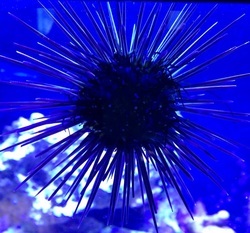 (The longspine black urchin is one of the venomous varieties.) 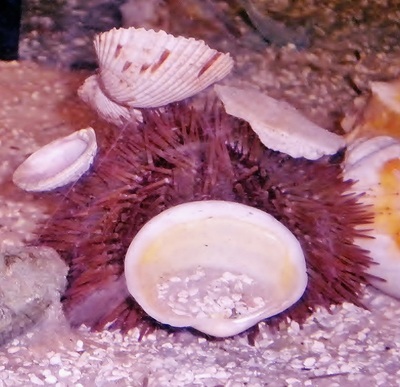 Flower urchins have venomous pinchers. They make homes in holes between rocks: If a hole is too small, an urchin will use its teeth and spines to make it bigger. They reproduce sexually: Sperm and eggs released into the water create tiny embryos that develop into swimming larvae before changing again into adults.